The ocean has given me my greatest gifts, best friends, most memorable adventures and some of my scariest moments. 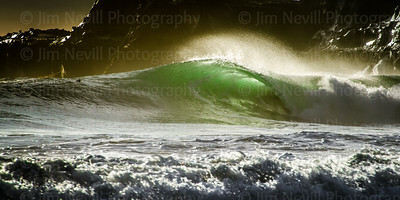 I started surfing over 25 years ago on Long Island, NY and moved to Sonoma County, CA in 95'. As a teenager I made the paddle-out one day during a hurricane swell (probably due to a lull) and I caught a few solid ones. Hooked for life after that. I have surfed extensively in Peru, Alaska, Washington, Oregon, California, most east coast states, Mexico, Costa Rica, and all of the Hawaiian Islands. 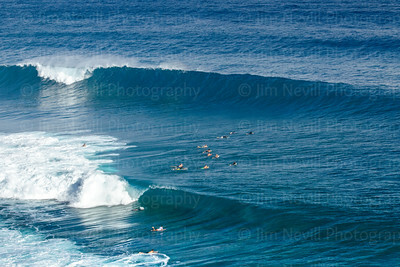 The Aloha spirit and my appreciation for the ocean is woven deeply into everything I do. 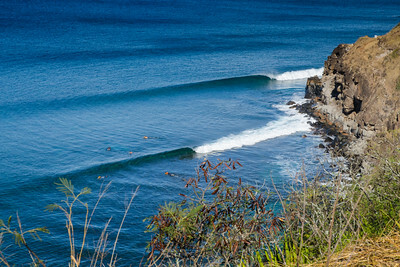 A more complete surf portfolio at Surfline.com/photos as well. 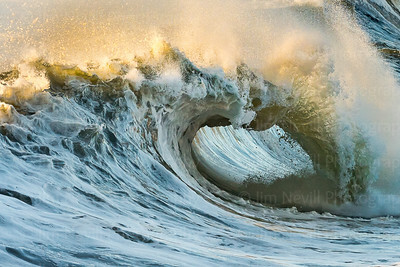 This wave only breaks a few times a year, but when it does happen it's fun to be there! San Francisco proper. Excuse this caption intro, quoted directly from Wikipedia: "Luminescence is spontaneous emission of light by a substance not resulting from heat; it is thus a form of cold-body radiation. It can be caused by chemical reactions, electrical energy, subatomic motions or stress on a crystal." Seen here is big wave surfer, Pat Shaughnessey flirting with a luministic paradox of destructive forces and incredible beauty. 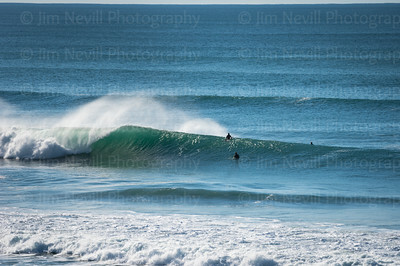 Maverick's, Half Moon Bay. CA. 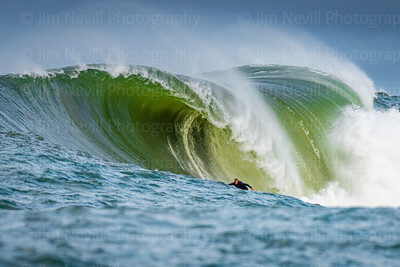 On November 28, 2018 - the season opener at Maverick's in Half Moon Bay, CA there wasn’t many perfect, clean or unridden waves but this beast reformed over the inside reef and no one was around. This moment was also met by a sudden burst of sunlight which helped my camera focus sharply on every drop of water and luckily it didn’t overexpose with all the spray. 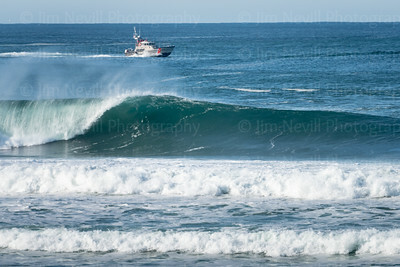 Such a pretty moment, a juxtaposition of menacing beauty and I was stoked I didn’t blow it! 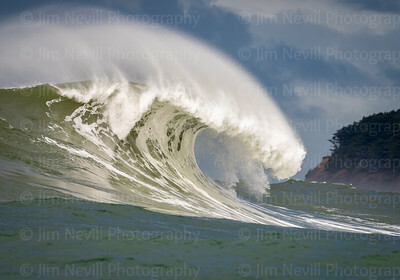 This has become one of my most published images on the internet. It's a bit of a camera trick with the compaction of the foreground and background resulting from shooting with a long lens. The boat is actually safely in the deepwater channel, only fifty yards from the massive set wave in the distance but do not mistake this situation as fully safe. At Maverick's anything can happen - and often does! 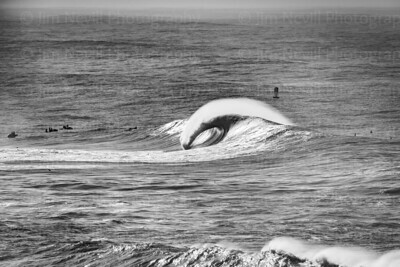 (1/19/18) The morning after the biggest west angled swell of the decade assaulted the Pacific Coast, the ocean was still in throws of passion. 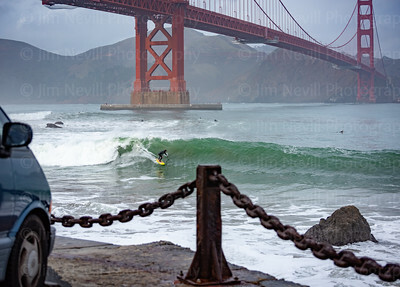 While yesterday’s 24 feet-19 second swell produced ominous conditions veiled in fog and rain, today’s 16 feet-16 second swell was more approachable and lit with warm early light. 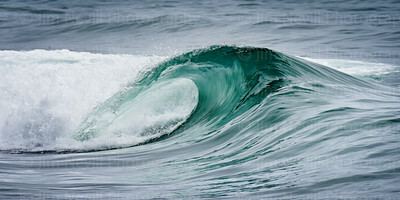 The churned up sea foam, rich in color and texture made for a muffled sounding wave that was much bigger than it looks. 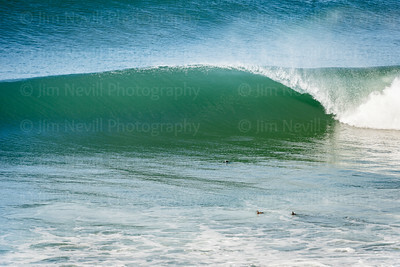 If a surfer were riding this wave, (s)he’d be standing upright in this tube. This day, no takers. The west coast has been blessed with back to back days of perfect surf with hard off shore winds, west direction swells and good sandbars. It's left the boys with sore arms and great stories to embellish on. Here is a NorCal local reaping the rewards. (el nino 2016). Ocean Beach, San Francisco, CA. A barrel bending the sandbar below, hooking left into the corner pocket. A perfect masse. 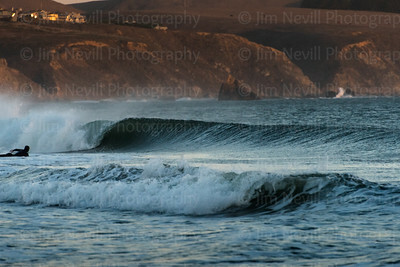 A lone surfer out at dawn at Steamers Lane in Santa Cruz paddles over a set wave to scout out his future options. 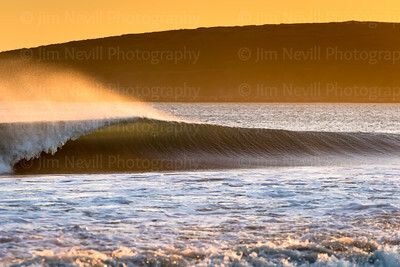 The light was just peaking the horizon at this moment which illuminated the wave top like this. When the world's most seasoned big wave surfers sit in close proximity to each other, scrambling for same waves things get hectic. 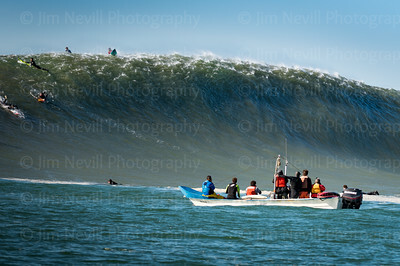 Greg Long, and humble ambassador for big wave charging, deciding to pull back on the largest wave of the winter, Mavericks, February 6, 2017. 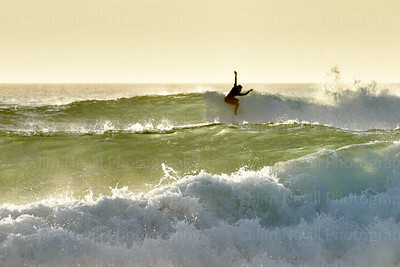 He'd later say he made the right call backing off, given how high his position was at the top of the wave. 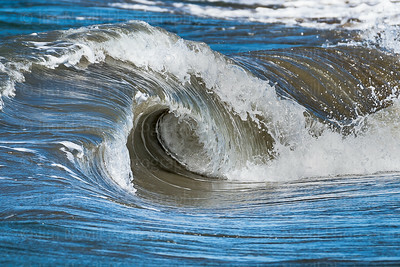 An unridden and undeniably mesmerizing wave rolls by. Cool and clear as she gets. Sot on the Nikon d810, drop for drop resolution. 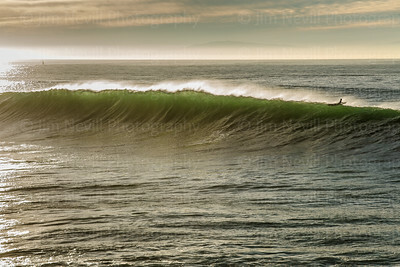 Beautiful evening lighting accenting the tops of waves as they break along the California Coastline. Spring 2016. What you ask does BCP stand for? Please comment and let me know what you think, but I may never tell. I am not a big Grateful Dead fan, more of a Hendrix fan but the name just seemed fitting. El Nino arrive in Northern California as the Bodega Bay Coast Guard takes a spin nearby. Being too far out on the shoulder is bittersweet; from one perspective you're bummed for missing the opportunity to ride a perfect wave, and from another you're stoked to just watch the beauty of the scene unfolding around you. 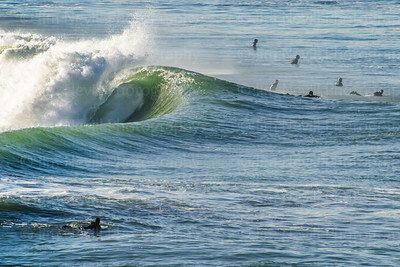 Warm amber toned tube, the California coast stuff of dreams. Instead of a written caption for this image, I thought it would be more fun for both of us to sing Elton John's "Tiny Dancer". 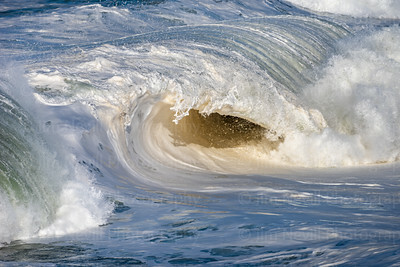 (Sing now to yourself) while admiring the beauty of this one foot wave breaking on the shore's edge. Chasing bulls begins. December 2015. Kaho'olawe mysto reef, After a long slumber, the first swell of winter arrived on Maui in October and I was lucky enough to get a call from a local Jaws surfer. 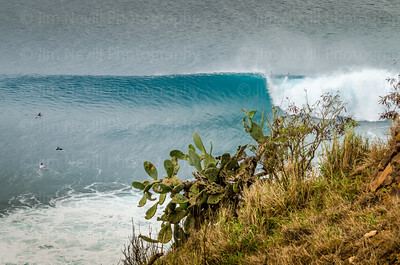 The next morning I was set up at this secret spot on the north shore shooting set after set or perfection, surfed only by the local boys and Maui pros. 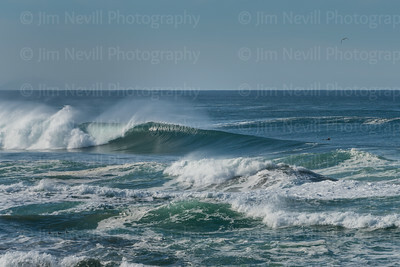 Many waves, like this one, went un-surfed this day…the boys were still getting their bearings.